So you’re thinking about becoming a yoga instructor, huh? Becoming a certified yoga instructor can seem like a daunting task, but I promise you that it isn’t. In fact, it can be an exciting experience for you to embark on in your life! Getting your yoga instructor certification can be incredibly rewarding, even if you ultimately decide not to use your RYT status to teach yoga. A good teacher training program will not only prepare you for teaching yoga but it will also facilitate tremendous personal growth. I promise you, it’s a beautiful experience inside and out. Before you begin any coursework to become a certified yoga instructor, take the time to fully understand what it takes to become a yoga teacher. Explore the ways in which you’d like to deepen your own personal yoga practice, the areas in which you’d like to see the most personal growth, and what kind of yoga teacher training program most fits in with your life. …or become an online yoga instructor like me! As you begin moving through all of these different aspects of yoga (and even get a little bit of teaching experience), you will likely see some noticeable shifts in both your personal yoga practice as well as your overall outlook on life. Needless to say, a yoga certification course can absolutely change your life. 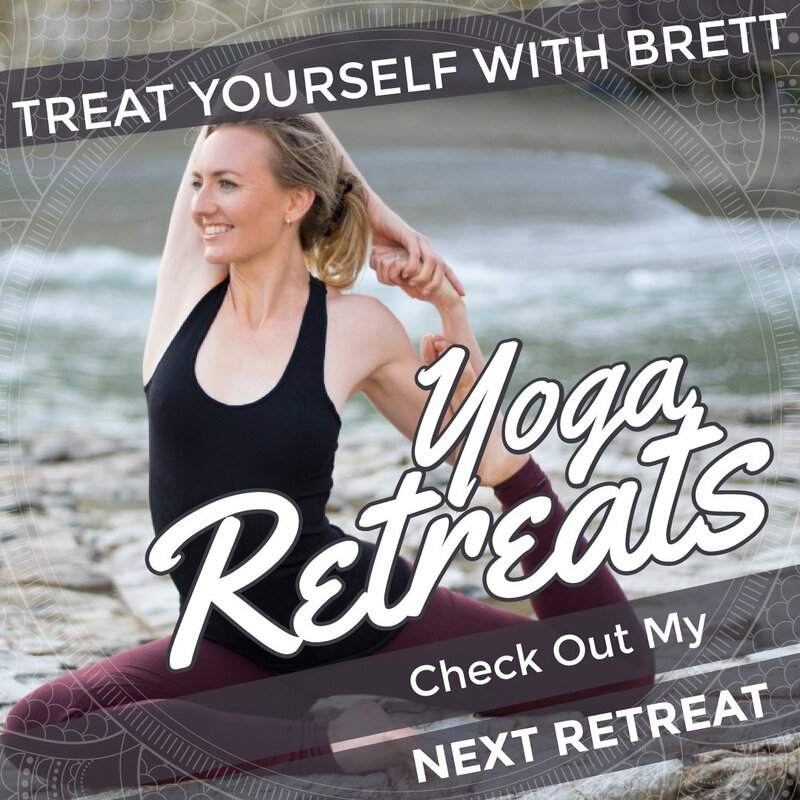 In this video on how to become a yoga instructor, Brett breaks down the most important aspects to keep in mind as you choose your yoga certification program. …then leave a comment below. We are all about this online community and I would love to help you begin your journey toward becoming a certified yoga instructor and learn what it means to live fully immersed in the yogic lifestyle. Hello, my friends, I’m Brett Larkin. Welcome back to my channel and huge welcome if you’re new. I post free yoga videos, here, on YouTube, at least twice a week, so I’d love it if you’d join the family and subscribed. I teamed up with beYogi to bring you this video, today, on how to become a yoga teacher. They offer fantastic yoga insurance for yoga teachers, and teacher trainees, and students, and I have a discount link, so I will link that up, both in the cards, and the description box below this video. So if you’re wondering how to be a yoga teacher, here is my personal short list of everything I think you should know. Number one, being a yoga teacher is not about being able to do all the fancy, complicated poses, like headstand, or forearm stand, or some of the arm balances. What it’s actually about is cuing, that means effectively using your voice to tell people what to do with their bodies, and compassion. So don’t get down on yourself if you can’t do all the super fancy things, because really good teachers are about great cuing and being extremely compassionate and loving with their students. Number two, certification in the yoga world is something that’s very much in flux. Yoga’s not really regulated by the state or at the national level. So you can pay Yoga Alliance for permission to use their RYT trademark after your name, but it doesn’t actually, really mean anything at the government, state, or national level. So it may or may not be worth doing, based on your personal goals. If you wanna deep-dive with me into what certification really means, I absolutely suggest you listen to this podcast that I will link up in the cards and the descriptions, in which I go into a lot more detail. Number three, you definitely wanna do some kind of training. Yes, you want to do a yoga teacher training, and the most common format is to do what’s called a 200-hour teacher training. So you cover a lot of material in 200 hours, everything from teaching, anatomy, philosophy. You wanna do research on where you do this 200-hour training, because it’s really gonna teach you everything you need to know about how to be a successful teacher. You can do a 200-hour training all at once, in a month-long in-person intensive, over the course of many weekends, or you can even do a 200-hour training online. If you do do something online, make sure that it’s interactive, and you’re getting direct feedback and support from a teacher over video conference. That’s exactly how my online training works, and if you’re interested in the online option, I’ll also link that up in the cards and description. Step number four is, you want to practice teach. I think a lot of people think they’re gonna do their 200-hour certification, and feel really confident right off the bat. The reality is it takes years to build up that confidence, to have a presence in your teaching, to really have a strong voice. So you wanna start practice teaching everyone you can. Teach your mom, your dog, anyone who’ll listen to you. Just start logging those teaching hours, because, just like anything in life, the more you do it, the better you’re gonna get. Step five is charging money for people to take your classes. This could mean that you’re teaching in a studio, or maybe you’re hosting events in your home. Maybe you’re teaching in corporations, like you’re going into businesses, and teaching there, or partnering with local restaurants to have yoga and wine nights. You could teach online, like me. There have never been more opportunities to find success as a yoga teacher in the way that you really enjoy, and are passionate about. Step six is to start a mailing list. Have a way that you can keep in touch with the people who come and probably really enjoy your classes. To me, this is even more important than having a website. And last, but not least, don’t forget to get yoga insurance. Once you have that, you are truly in business, and I will link to beYogi, which is my top pick, in the cards and description below. If you’re considering the yoga teacher training journey, I have dozens of free podcasts all about how to pick a training that best meets your needs, the exact questions to ask, tips and tricks to make the most out of your training experience, and how to know if you’re ready to take the plunge. And, of course, I offer an online yoga teacher training course that will walk you through all of it. Good luck on your yoga journey and I’m sending you so much love.